Precious Pages by Paula: CAN YOU RESIST THIS? Today I had some fun doing white glue resist on an art journal page. I shared the full instructions over at Scrapping Everyday Miracles. Here's a quick run through of the steps and a photo of the final results. Cover page with a thick layer of gesso. Add a design with cheap white school glue. Let air dry for at least 24 hours. Rub on another color acrylic paint. 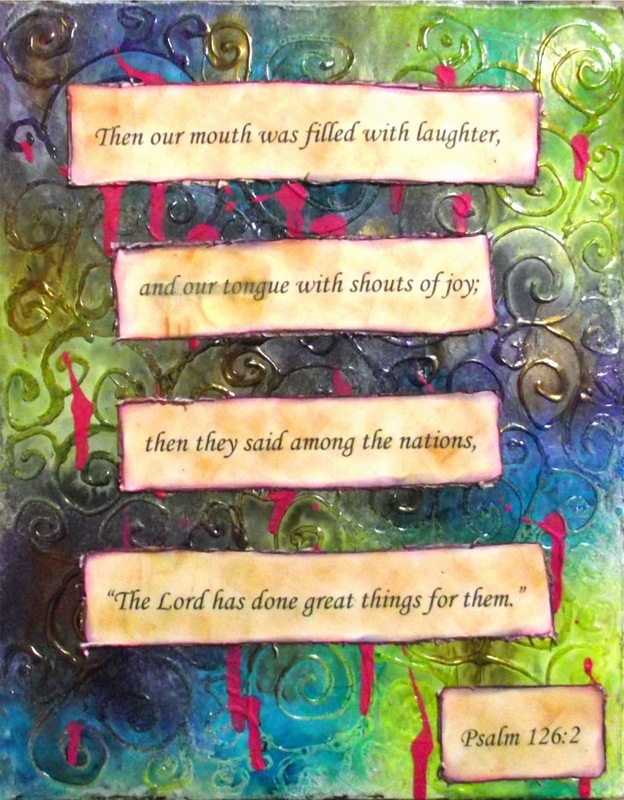 Print a scripture out in lines and cut apart. Distress and ink the edges and the scripture. Hope you have enjoyed this peek of my creation. For full detailed instructions be sure to check out my Design Team post at Scrapping Everyday Miracles on March 10, 2014. I am also entering this over at Word Art Wednesday for challenge #123 Anything Goes. Ii saw your tutorial for this, it is remarkable. This is a beautiful work of art and I thank God you shared your talent with us this week at Word Art Wednesday. Very pretty technique. Thanks so much for joining us in our Word Art Wednesday challenge this week. We love having so many beautiful designs showcased like yours each week. We appreciate your support.